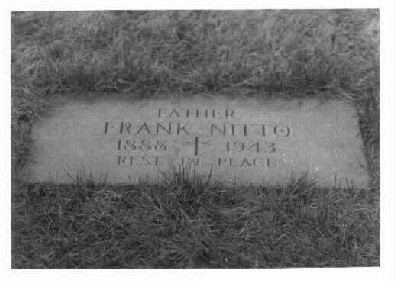 Real name Francesco Raffaele Nitto, Alias Frank "The Enforcer" Nitti. 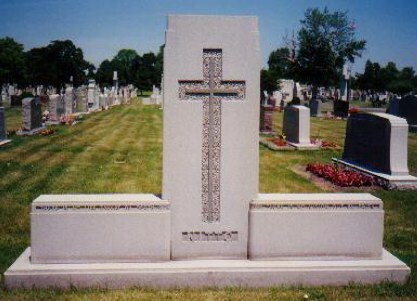 Born in Italy, on his draft registration card his birthdate is listed as January 27,1886 , which means his headstone maybe incorrect. He arrives in New York city as an impoverished youngster. Frank Nitti makes his appearance in Chicago after World War 1. He was living at 914 South Halstead upon his arrival with Rose Nitto. He debuts as a part time barber and jewelery fence for the criminal element , but soon rises thereafter with his business and accounting acumen. He is noticed by Capone and becomes his number two. known as "The Enforcer" which only means that the orders entrusted to him by Capone are then in turn related by Nitti to the stable of eager Capone killers with the emphasis of getting the job done right the first time! After Capone's reign is over, intersquabble between Humphreys, Nitti, Newberry are qualmed when Nitti is thrust up to the job of gang overlord. 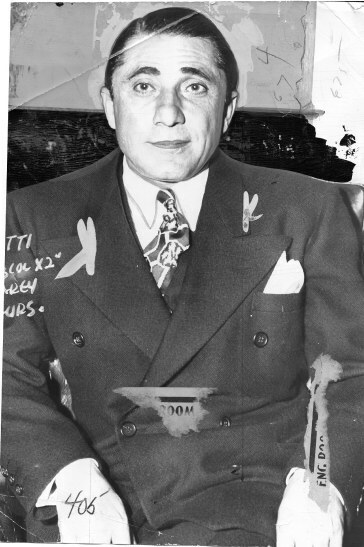 Nitti is known as a mob man who worked out in the field of gangland and knew the ropes well. Besides, Nitti had the job of taking care of business whenever Capone left town. He was already used to it and so the choice was an obvious one as he was also probably chosen by Capone. Once Nitti finishes his sentence in prison, he will take over Al's job as successor. 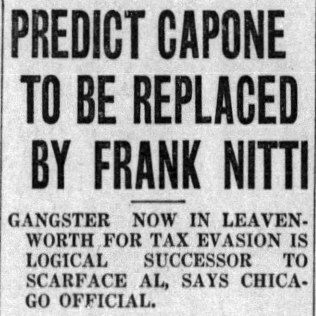 October 30, 1931, Newspaper headline predicting Nitti to take Capone's place as chief of The Outfit. Nitti is finicky for details and gives his point of view to Al on many hits. 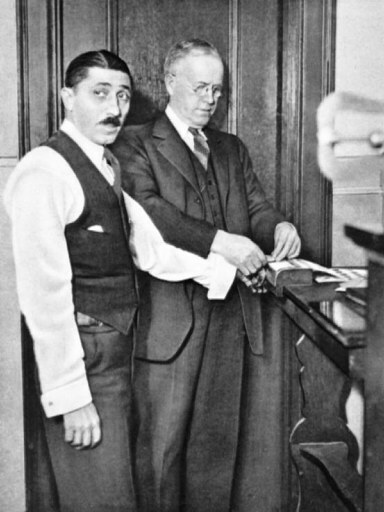 Frank Nitti is on the planning for the Hymie Weiss hit in 1926, which shows just how unflawed the murder was. Never one to kill with his own hands, which is ironic given his nickname "Enforcer". During the twenties, Nitti was mostly in charge of directing the liquor and vice enterprises of Capone. 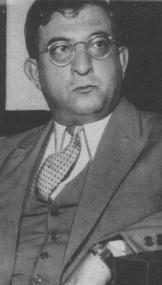 In 1930 Frank Nitti was indicted in the federal District court. The charge was that he failed to pay income tax for the years 1925, 26, and 1927 the total of $277,000 of an alleged $743,000. Frank Nitti then disappears to Italy (probably actually hiding in Florida thru underworld connections) to spend some of his money (Proof). 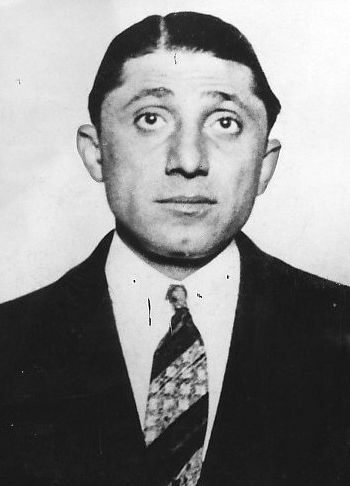 He was trapped by in the U.S by federal agents and sentenced to 18 months of prison.Frank Nitti was known to be clausterphobic beyond belief, which made his prison stays totally unbearable for him. He was let out for good behaviour. 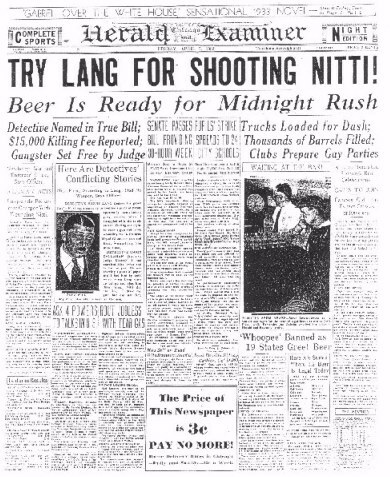 On Dec. 19,1932 two chicago policemen named Harry Lang and Harry Miller visited Nitti in his downtown office. 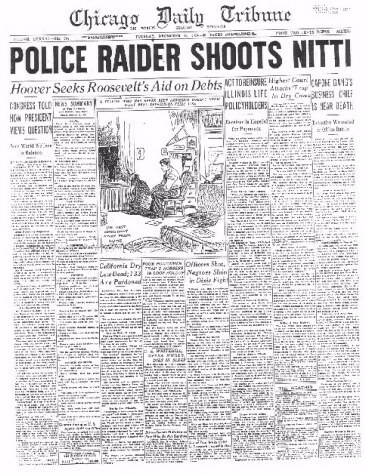 Headline for Dec.20th 1932, Frank Nitti is shot. No, those are not bodyguards! Nitti in company of detectives. 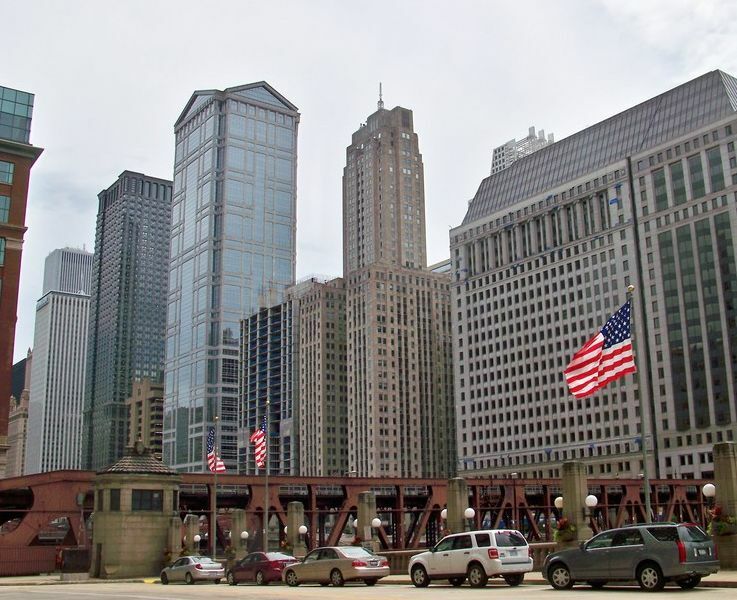 LaSalle - Wacker building (center) where Frank Nitti was shot on Dec. 20,1932. 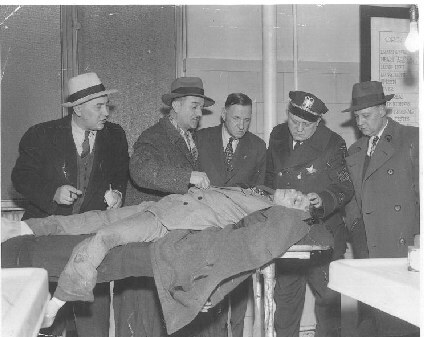 April 7,1933 truth comes out Nitti is shot at unarmed by Detective in a setup. Nitti was shot and the police alleged that Nitti had made an attempt with a gun towards the officers. Nitti spent months in hospital recovering. It was found out that Nitti was set up. Miller reported that his partner had been paid $15,000 to kill Nitti. 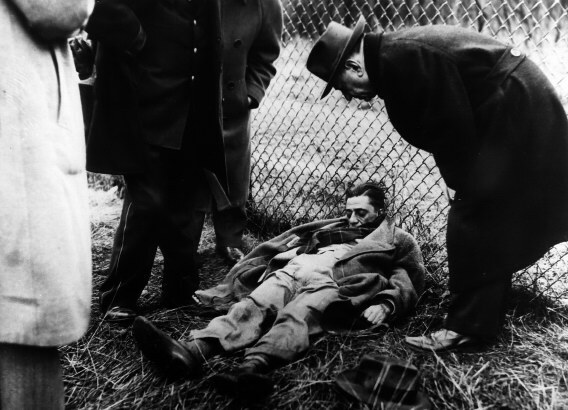 (Some say Mayor Anton Cermak paid to have Nitti killed) Nitti was unarmed at the time when Lang first shot himself in the hand and then shot Nitti in the abdomen. After a trial both policemen were fired from the force. Nitti was thrust in the news and was now what the newsmen needed to fill the crime beat after Al Capone had been sent away. It was assumed that Nitti was now the real power behind the Chicago "Outfit". 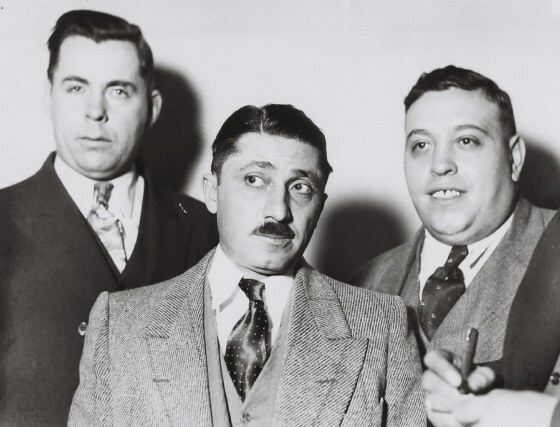 As a matter of fact in 1937 Frank Nitti and three associates controlled all of Cook County gambling. He also began what was said to be a "purge" of the outfit by eliminating anyone who might cause him or the outfit trouble. (Jack McGurn, Fred Goetz,Gus Winkeler, Jack White etc....). He did manage to branch out into other things besides gambling, especially now that the liquor days were over. One of Nitti's many court appearances. 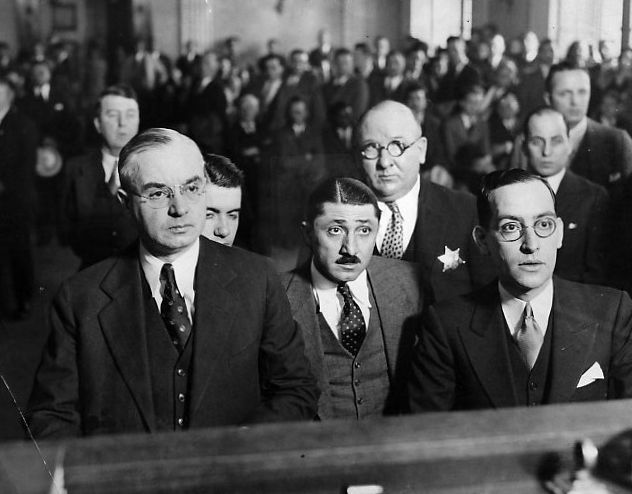 In 1941 the Nitti mob had made net profits of $139,000 per month. Vice and unions were also supplying more cash for the outfit. At first, restaurants, hotels, bars, then (their downfall) in the form of extortion from Hollywood studios soon followed suit. Nitti and his co-horts were charged for the $2,500,000 shakedown of four major picture producers. Paul Ricca ,Louis Campagna and others were also charged and faced jail time. In a sitdown with Ricca and company, Nitti was demeaned by Ricca in front of the others and told how" he had let the outfit down" and that since "Nitti being the originator" of this shakedown that he" Nitti should gallantly face the prison time alone", in place of the others who let him be in charge. He was also told that it was he who trusted a stool pigeon by the name of Willie Bioff who turned them all over to the FBI. Nitti was dumbfounded on how they treated him and that they could care less about what good profits he had brought over the years to the outfit. After the meeting, Nitti felt alone and began thinking of the prison time ahead which frightened him. He began to think of a way out. On March 19,1943, Frank Nitti makes sure his wife Antoinette is on her way to Our Lady of Sorrows church to make a novena. Frank went to the liquor cabinet and started to drink up the nerve for what he was about to do. 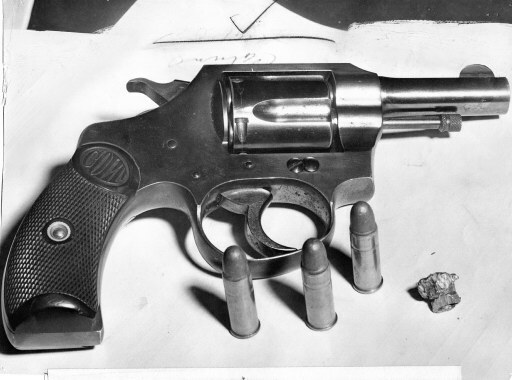 While drinking, he loads a .32 caliber revolver and puts it in his coat pocket. He puts on his brown derby and exits the door. While walking as the effects of alcohol begin to numb, Frank crosses over to the railway yard.Two Trainmen, William F. Sebauer and Lowell M.Barnett notice Frank walking drunkly across the tracks. He walked on the tracks of their oncoming train.They thought he would be killed ,but instead see that he is walking over to the next track just then Seebauer yelled "Hey there Buddy!" and then two shots were heard.The trainmen thought he was shooting at them,but they quickly realized he was trying to end his life. Frank Nitti sat on the ground along a railway fence and paused. One of the trainmen suggested charging the suicidal person. The other stated it was too risky for them, being family men, and especially since the person in question was drunk with a loaded weapon. Frank lifted the gun one more time and placed the pistol to his head. A shot rang out just as quickly as the life oozed out of the aging gangster. It was later stated that Frank may have also been suffering from cancer. Frank Nitti left behind his third wife Antoinette and his adopted 9 year old son Joseph adopted with his previous wife Anna. Nitti was also known as a good family man ,husband and doting father. On the family monument is the inscription "There is no life except by death""There is no vision but by faith "
Frank Nitti found dead after pumping 3 shots at his head alongside railway fence. Only one shot was fatal. Gun found beside Nitti along with unspent shells and one bullet removed from his head. 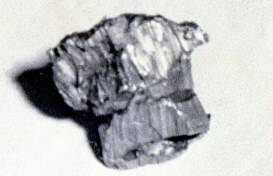 Closeup of bullet removed from Nitti's head. Frank Nitti's home in Riverside 712 Selbourne rd. in Riverside, Illinois. 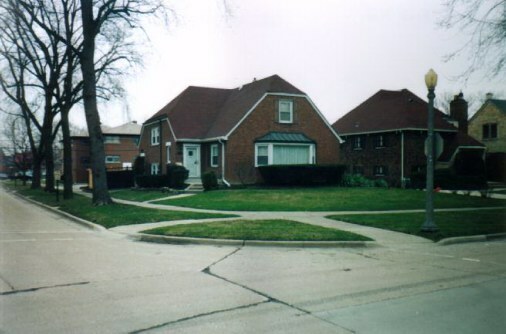 Nitti's old homestead in Riverside as it appears today.